Designing a bedroom completely from scratch? Go and have a read of out guide to designing a bedroom too. Where to put your dressing room or walk-in wardrobe? If you're lucky enough to have a box room next to or near to your master bedroom, this is the perfect place to site your dressing room – and it can stay separate from your bedroom, saving you the cost of knocking through. If you're planning a major renovation anyway, blocking up the door between the box room and the hallway and opening up the wall between the box room and your bedroom will give your space more of a master suite feel. In both cases, lining the walls of this set-up with clothes storage and perhaps room for a dressing table, with a bench for seating or extra storage in the centre of the room is the best use of space. See our pick of the best dressing tables if you want to upgrade from just using the top of your chest of drawers to do you makeup. No room for a separate dressing room? You can recreate the feel of a dressing room or walk-in wardrobe on a long run of wall or large alcove in your bedroom. Use wardrobes or a stud partition wall behind the bed to make a dressing area that feels like a separate space – just ensure the lighting is adequate. You can also use a curtain to create the illusion of a separate space. See our dressing room and walk-in wardrobe design ideas for inspiration. Carefully assess your clothes storage needs and preferences. Do you prefer to hang or fold the majority of your garments? How much rail vs drawer vs shelf space will you need? Factor in shoe storage, handbags, swimwear and accessories, as these smaller items are often the most challenging to store neatly. Don't forget makeup storage and jewellery storage, too. Shelves instead of drawers for your jumpers and jeans are a good idea, using dividers and designated compartments to keep your clothes in a neat pile. 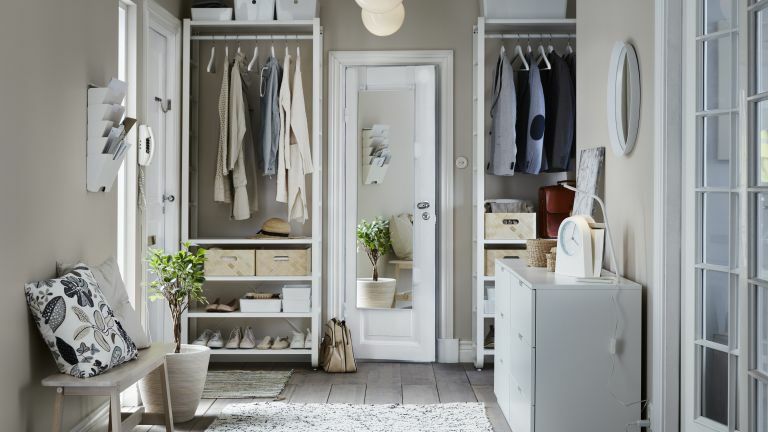 Hanging space is a must, but make sure you have enough room for full-length garments as well as shorter ones, and double your clothes storage by incorporating shorter hanging if you only need to hang trousers or skirts. Hangers or slide-out fixings? A combination of both is good. Fitted or freestanding dressing room furniture? Fitted options are more expensive than off-the-shelf wardrobes, but have the advantage of being fully customisable to your space, increasing your storage by, on average, 30 per cent, and therefore freeing up more floor space. Remember, too, that a fitted walk-in wardrobe is a selling point that, if done well, adds value to your home. When it comes to choosing your storage furniture, have a combination of types, but be mindful that drawers cost more than shelves or hanging space. If you are on a budget, use shelves and storage boxes in place of drawers. Also, choose an affordable, good quality carcass for your wardrobe and dress it up with investment doors, handles and soft-close hinges. You’ll need a place to sit; somewhere to try on shoes, sort out socks or simply relax. An ottoman with concealed storage under a window or placed in the centre of a dressing room is a great way to add grandeur to a space. Check out our pick of the best ottomans for your dressing room. The dressing table is important to get right: if you are sharing with another person, consider a dressing table arrangement that will let both of you to use the space at the same time. An open display cabinet is perfect for showcasing treasured belongings, and will also allow easy access. Mix and match open and closed storage options to combine ease of access with tidiness. Foldable items and shoes do best on display, while smaller items, such as belts, scarves and underwear, can be put away in container storage (oh loook, we have a buying guide for that! See of pick of the best storage containers). As we've said, custom-made piece of furniture can be tailored to your needs and work harder – ultimately allowing you to make the best use of every inch of available space. For example, built-in drawers and cupboards in a dressing room between the rafters is a fantastic use of an attic area, as it does not eat into the floor space, so will make a room feel bigger. Corner spaces also yield readily to bespoke solutions – think plenty of shelving and drawers. On a budget? You can recreate a fitted feel with careful measuring and buying from storage specialists, such as Ikea. If you are cramming a small space with storage, you need to prevent it from feeling enclosed. Wardrobes that reach all the way to the ceiling will maximise your storage, but will make the room feel smaller. You can combat that with mirrored doors on wardrobes, or furniture in light-enhancing colours and high gloss finishes. Not going for mirrored wardrobes? A freestanding mirror is a must in your dressing room, and floor-to-ceiling designs can really give the wow factor. If you don’t have floor or wall space available, consider mirrored wardrobe doors, or hanging a mirror on the inside of a door. Lighting is key in your dressing room – thinking your lighting scheme through carefully will enable you to make the most of the space. Where possible, try to locate your dressing table in front of a natural light source. If this isn’t possible, make sure you add some spot lighting, even if the room is small. Aim for the magic number of at least five light sources, not only for practicality and visibility, but to create atmosphere and spotlight accents. Don’t forget the sockets – the last thing you need is to create your perfect dressing area and then have to stand on the other side of the room to dry your hair! There's no denying that the craze for tidying, started by Marie Kondo, reaches its peak in the bedroom, with her KonMari method for folding clothes a genius way to make each item of clothing accessible and to keep it neat. Use our guide to find out how.